In Detroit, many once thriving neighborhoods lay in ruins. Most of the houses in many city blocks can be in a state of severe disrepair, including some that have been completely gutted or burned, with perhaps one or two inhabitable homes that appear to still have people living in them. It should also be noted that 62,000 homes in Detroit last year were foreclosed. It looked like a city after a war. Where do you think the children play? I went to Detroit to attend the Social Solidarity Economy Network Forum. Organized by the Intercontinental Network for the Promotion of Social Solidarity Economy, or RIPESS, the forum addressed several problems by raising awareness that this type of economic debauchery is contagious unless we as citizens deal with it where it lives and rout it out from the roots - which inevitably lie in system-wide corruption. The Social Solidarity Economy Network Forum took place in April, and it was the first project of this North American coalition. 1) self-care is a topic I heard a lot of people repeating as a number one issue to consider - no one can help a movement without taking care of themselves first - period. 3) Strengthening our connections to each other and to our communities were the topics that most workshops took time to discuss, even if not on their agenda. Cooperative people came from around the globe to share experiences and lessons learned on our journey towards building a solidarity economy network. Laura Flanders was host to the opening of the conference and William Copeland (East Michigan Environmental Action Council) welcomed everyone to the event. Emily Kawano (RIPESS and US Solidarity Economy Network) gave the opening plenary as an overview of the International Social Solidarity Economy movement and defined the role of NASSE. The crowd of 400+ citizens of the planet convened in solidarity at The Samaritan Behavioral Center where people could gather in small workshops to discuss and find paths to eradicate racism, sexism, cultural blockades and to unite on some single purpose methods to change the world we live in. The conference was a success in that it brought a diverse group of people together to transform the Solidarity Economy movement together and move forward on the road to "ownership" of the tools and the means of production! Many people at the forum represented a worker-owned cooperative, and are members of the United States Federation of Worker Cooperatives (USFWC). This organization does a tremendous job of gathering resources and sponsoring events that raise awareness and bring worker solidarity to the forefront of the Solidarity Economy Movement. The Samaritan Behavioral Center had a large auditorium for the plenaries, group activities and panels which spoke to the group as a whole. The workshops were held in smaller conference rooms where people could easily participate in the conversations and connect with people to exchange contact information. In the large gathering hall panels with guests from Mexico, Canada, Greece and other parts of the world discussed how solidarity has affected their communities and what measures are needed to be put in place for the future generations to maintain solidarity. A generous time was allotted for questions and answers, of which there were plenty. Two Questions that come to mind addressed human rights and acknowledging that access to the Internet is a human right, which I will detail later in this article. Free software for the revolution! Yes, we all agreed that the foundation of any people's movement for freedom must be built on a solid platform of freedom, not the privately owned platform. This means that we must build the future using free software, and free hardware must be a component also. How will we do this on the ground? There must be free workshops for people in their own towns to learn about the options for privacy and security along with protecting their liberty. This brings to the forefront - the Free Software Foundation in Boston, MA. The foundation is at the epicenter of our future freedoms and has many volunteers that help to raise awareness and introduce free software to the world through the GNU project. The GNU project is a collection of free software available for downloading. Their tireless efforts working with other organizations that protect our freedom, like the Electronic Frontier Foundation will make the world a better place for each individual citizen, and the collective population also. 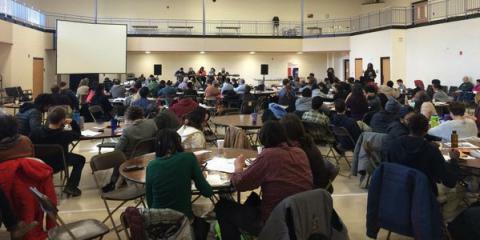 What are the highlights from the North American Solidarity Economy Forum (NASSE) in Detroit on April 8th through the 10th? The conference was well organized with plenaries, panels and enough smaller break-out workshops that allowed maximum interaction between participants. Diversity was present in all ways imaginable with people from around the globe in attendance. I met people from Greece, Canada and Mexico that are all involved in similar efforts to raise the cooperative levels in their community. The program of inter-related workshop and panel topics addressed by this event showed that a great amount of thinking went into the details and to covering the most vital issues that can propel a movement forward. Three topics emerged as the focal points of NASSE, and they are conversations and actions based on de-colonization of the Solidarity Economy, inclusion and getting to know each other better and the use of free software for the platforms we build and share. The workshops consisted of many different tracks such as “Intro to the Solidarity Economy”, facilitated by Julie Matthaei and Jessica Gordon Nembhard of SEN. This open discussion covered the definition of the movement. It is really important to have an introduction to the framework of the Solidarity Economy at all events, for people new to the movement. There was one titled “Occupy, Resist, Produce. A talk with workers of the occupied Vio.Me factory in Greece”. Workers from Vio.Me Factory in Salonica, Greece detailed how they occupied their workplace and resumed production, while waging a legal battle to stop the corporation from selling the land. An amazing group discussion ensued. All of the workshops were inter-connected in general theme as they relate to a community. What is good for the community in the way of connecting people to support creativity, privacy, autonomy and wealth - specifically communal wealth, without which a community does not truly exist. Wealth has been defined by a financial measure and the worth of a person is measured according to their assets. The Solidarity Economy Movement shows us that belonging to a community that treats members well and operates on the 7 Cooperative Principles can be the future. At the conference, I facilitated a workshop titled: "Internet as a Human Right: the Role of Cooperatives and the Solidarity Economy" hosted by Juan Gerardo Dominguez Carrasco, MayFirst People Link. We talked about the Internet as an educational tool and foundation of our emerging new connected society. The need for rapid communication of information is not just a desired element, it is a necessity for being a relevant contributing member of a community and a citizen of the world. Without the Internet a person is relegated to a level of ignorance that will limit them to being low wage earners and unskilled workers. There were workshops on a financial track that presented strategies for communities to practice alternative banking methods such as time banking and group loans for local initiatives. Ed Whitfield and Marnie Thompson both of the Fund for Democratic Communities in Greensboro, N.C., led a powerful workshop and discussion based on a cooperative they are helping to develop The Renaissance Community Co-op (RCC) in Greensboro, North Carolina. Their efforts will provide healthy food and a positive workplace for locals. They shared the methods they have been using to build a business that sustains the community. Local to Detroit, the West Grand Boulevard Collaborative, started in October, 2004, by Mildred Hunt Robbins and Tommie E. Robbins, Jr. is currently making good progress in revitalizing the community they live in. Plans have been made to renovate a gutted high rise building. They formed a group to have an alliance with neighbors and to have a bigger voice when raising concerns with the city. De-colonization of the Solidarity Economy Movement was front and center in almost every aspect of the event. We are defining what it means to grow up colonized into an Extractive Economy (one that does not re-invest in the communities where the workers live) and the pathways to exit that state of mind, old traditions and ideologies. Some workshops that included a discussion on de-colonization found that listening to people add their voice to the solutions was inspiring. Inspiration alone does not a movement make. More is needed to give people the strength and fortitude to carry the movement forward. Workshops on healing and healthful living are a large part of the solidarity economy as we begin to treat the sources of trauma instead of just the symptoms. Creative problem solving along with collaborative games and exercises promotes good relationships. Action is another part of the solution and together, in solidarity, we can define powerful ways to act. One of many great examples of 'action', is Cooperation Jackson in Mississippi. They are taking some positive direct actions to change laws and city ordinance by working with the mayor and town officials to make changes on specific issues that affect their community. By having open and inclusive discussions and presenting solutions to problems, cooperators have found that some of their local representatives have ears. A great way to get involved is to ask questions of your local activists and see what initiatives are already in progress. Detroit is not unique and this type of devastation can happen anywhere if we are not vigilant and constantly remaining alert to changes in laws and ordinances where we live. When Government services are removed from a city, neglect and decay prevail. The civil servants of Detroit have been remiss in their duties by implementing pernicious policies that have destroyed the city and led to bankruptcy, as this case study shows. I would love to hear about the efforts in your area to prevent Detroit policies that led to this destruction of lives and homes from landing on your doorstep. Michele 'Micky' Metts is a software developer and community activist. Her previous experience includes creation and development of diverse online communities, and small and large websites. Michele has also managed many diverse teams of programmers to create custom applications specifically for community use. As a pioneer, working with VoipDrupal technology, she has created and presents VoipDrupal webinars in conjunction with the MediaLab at M.I.T. Micky was formerly a punk rock bassist and guitarist, a welder and a silversmith, a formula racing pit crew member, and a creator of some radically modified late 1960's VW beetles. Michele travels to events as a speaker presenting on topics ranging from Community Building, Industry Organizing and Cooperative Development, to some interesting modules and things you can do with Drupal.